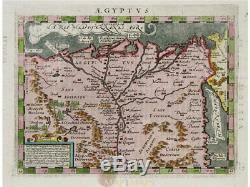 Egypt map Aegyptus Geographiae Universaetum Magini 1597. Beautiful 1597 antique map of the Nile delta of Egypt. Issued by Claudius Ptolemaeus, Claudius Ptolemy ancient world maps. Claudius Ptolemy was a Greco-Egyptian mathematician, astronomer, astrologer, and writer. Editor: Giovanni Antonio Magini (1555 1617). 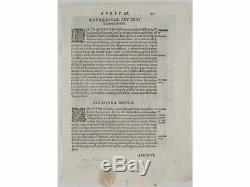 Origin: Geographiae universe tum veteris, tum novae absolutissimum opus Second edition of the Magini Edition, the last significant Ptolemy adaptation. Published in Cologne by Peter Keschedt, 1597. Koeman III, map 8650:381, ed. 16th -17th -18th-19th Century maps & atlases & prints. We sell guaranteed Absolutely Original authentic Maps and Prints. A Certificate of Authenticity (COA) will be supplied on request. 23.5 x 17 cm. 6.75 x 4.75 inches. 17 x 12.5 cm. All maps and prints are genuine, authentic, published at the date stated above. 3 day's Global Express Courier Services on request. The item "Egypt map Aegyptus Geographiae Universaetum Magini 1597" is in sale since Monday, January 28, 2019. This item is in the category "Antiques\Maps, Atlases & Globes\Africa Maps". The seller is "mapandmaps" and is located in Europe.